The SALI standard offers a unique coding for matters and simplifies how they can be managed, while improving our data analytics and reporting, digitizing procedures – moving the needle with measurable value. Legal departments are accelerating the innovation process and the SALI standard is an enabler to that end. Background Note: The Standards Advancement for the Legal Industry (SALI) Alliance promotes an inclusive industry neutral standard for the progress of legal industry transparency, efficiency and innovation. It was founded by Legal Marketing Association and Association of Legal Administrators. Its mission is to create a common language for all participants for the delivery of modern legal services. The Standards Advancement for the Legal Industry (SALI) Alliance announced today [January 29, 2019], during LegalWeek in New York, the release of the SALI Version 1 matter category standard, which includes the publication of area of law and process codes. SALI’s matter coding structure is unique: structurally consistent, digitized via modern programming interfaces, scalable, extendible, and party-neutral, providing a common language for firms and clients. 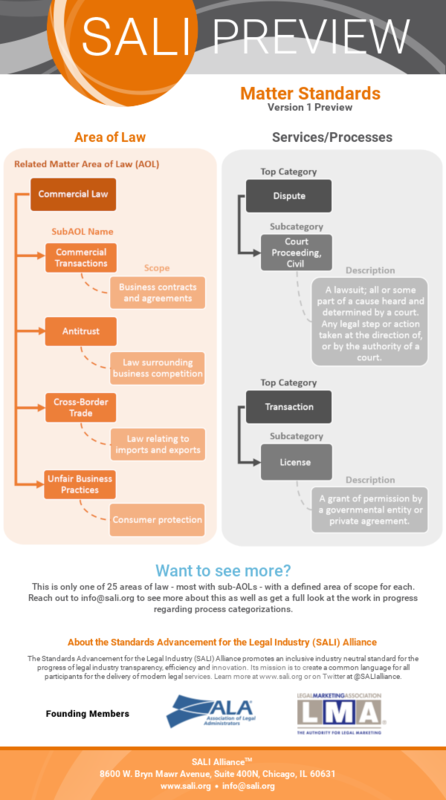 SALI also announced its intent to publish the second release of the code during the LMA P3 Conference this coming June, which will further extend the taxonomy for location, jurisdiction, and other key business drivers of legal matters.